What should Zodwa decide to do? From the table you can see that the bad or not cool effects for options 1, 2 and 3 are many. 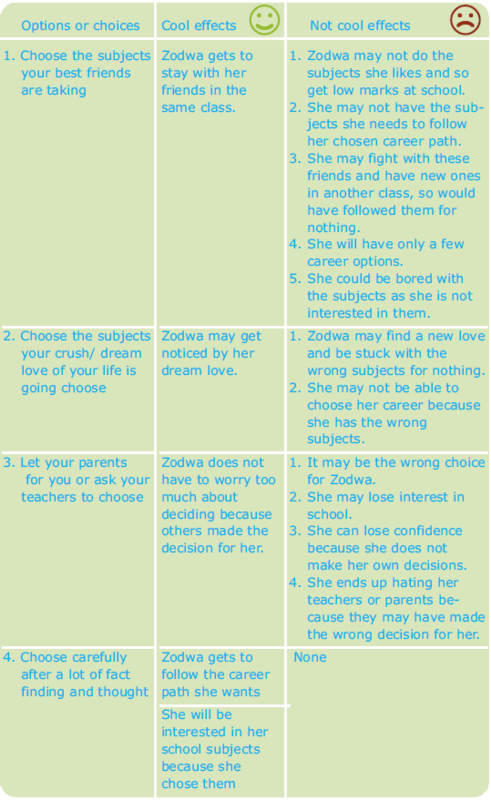 There are NO bad effects for option 4; so Zodwa should go for option 4. This means she should choose carefully after a lot of fact finding and thought. This decision is about her future, not only about her subject choices for grade 10 onwards. 2. Discuss the choice you made for Zodwa. Explain why you made that choice (a, b, c, d, or e).